If you have pre-teens in your household, its very likely that you have heard of Disney’s “Club Penguin”. Club Penguin is a very popular website-based virtual world aimed at pre-teens and tweens that is based on the creation of adorable penguin characters who interact with each other in the Club Penguin world. Now, released on May 9th, Disney has published a companion app for your child’s favorite interactive penguin world called ‘My Penguin’. Now your tween can take his or her Club Penguin anywhere via their iPhone or iPad. ‘My Penguin’ is geared toward kids who already have an existing account with Club Penguin. New users can, however, create a new account via the app. 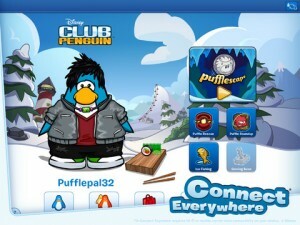 The app essentially enables members to be able to play some of the popular website’s mini-games (Pufflescape, Puffle Rescue, and Puffle Round-up) with their penguin character. It also sports a brand new app-exclusive mini-game called Sushi Drop. The app also includes access to the Club Penguin blog, as well as the Club Penguin video network so kids can stay up to date on the latest in game news. Kids can also use the app to shop for clothes and accessories for their penguins with (virtual!) currency that is earned in-game. Clothes that are purchased can be used to dress penguins in the app. The My Penguin app is also able to sync with the child’s Club Penguin account, so all coin totals and purchases are always accurate between the two. Children can also add new friends and interact with them through the app. While it does not have all of the features of the Club Penguin website, My Penguin comes pretty close! Best of all, My Penguin is a free download and doesn’t contain any ads or in-app purchasing opportunities (Thanks Disney!) To check out the new My Penguin app from Disney, click the Apple iTunes App store button below.